CBE Assessment: Consignment bikes at CBE go through our 50+ point “delivery checklist” as an independent assessment process. This checklist and companion notes are available upon request for qualified potential buyers. Mechanical: This machine comes from a very good – and knowledgeable – home (please see owner’s statement below). In a word, it is well sorted and ready to ride for the 2018 season. 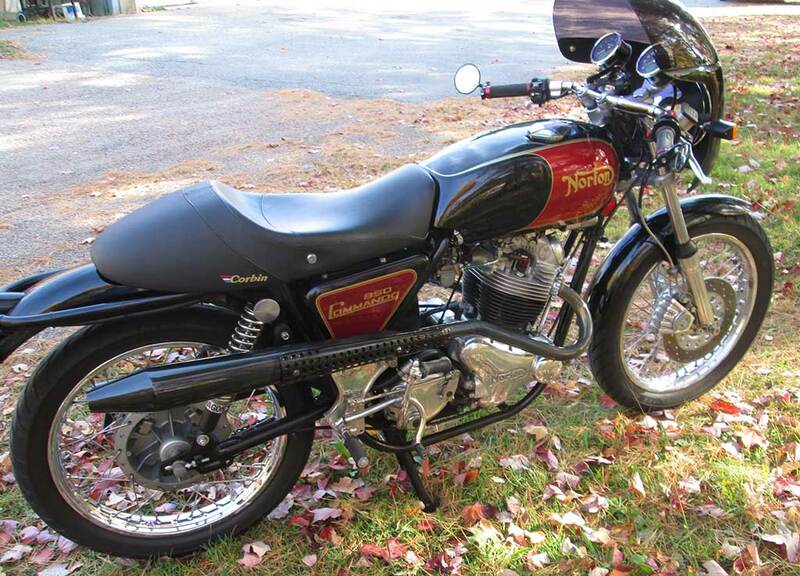 Relatively low mileage and seems correct based upon the condition of the bike overall. Everything works as it should and there is nothing more fun than bombing around on a big single. Sensible upgrades add to ease of use and maintenance including electronic ignition and a spin on oil filter. Tires and other rubber bits are in good shape. Please note that these models have fiberglass tanks that will not hold up with ethanol fuels. Liners will work for a while, but the best solution is to use non-ethanol or fit an aftermarket steel tank, which are available out of India from Enfield County listings on eBay. They are pre-painted with “free” shipping for reasonable $$$. Based upon the above we have rated this bike VERY GOOD mechanically. Cosmetic: Overall, this is a great looking bike with a patina finish. It is a rider, not a hider, so some time with polish, etc. will bring up the luster quite a bit. Chrome overall is in very good shape with just some minor pitting here and there. Aluminum parts are the typical dullish patina, but no excessive oxidation. Pricing and Paperwork: B44’s have held their value over time and are one of the more affordable classics to enjoy. Victors command higher prices, but the Shooting Stars are just as fun. A Vermont registration and bill of sale are available, but no title as they are not required in Vermont for bikes over 15 years old. A Vermont title can be secured by the owner from the state if desired but would be negotiated separately. Owner’s Statement: I bought this bike in Ontario in 2006 from a Brit bike enthusiast who had bought from original owner in 2005 in Maryland. The major modifications include a Pazon electronic ignition, a spin on oil filter, and a rebuild of the Amal carb by Waldridge Motors. The bike has been lightly ridden as I acquired a T140 Triumph which became my major rider and in later years, has not been ridden at all because of health problems. It has been stored indoors and treated as the nostalgia piece it is (nearly identical to a B-44 I had ridden daily in the late 60’s). If the asking price is met, I will include a B25 gas tank, interchangeable with this model and an original owner’s manual and B44 parts list. This entry was posted in news on April 11, 2018 by Stephen Kastner. Mechanical: At CBE, we are partial to the 73/74 750 Triumphs. They still retain the classic right-hand shift and do not have all of the clap-trap that came along in the 75 and later models. The motors have a lot of pop, a robust 5 speed gearbox and disc brake. They look and sound the part with classic Triumph lines and performance. This machine comes from a very good – and knowledgeable – home (please see owner’s statement below) and has had work done on it at our shop in the past. In a word, it is well sorted and ready to ride for the 2018 season. Relatively low mileage and seems correct based upon the condition of the bike overall. Everything works as it should and the pattern Dunstalls give it a lovely rorty note. Sensible upgrades add to ease of use and maintenance. JRC/PWK flat slide carbs with pull chokes, coupled with a Pazon ignition, ensure reliable starts in one or two kicks. As the top end has been redone by a reputable shop in the past, there is plenty of compression, no leak-down and a pretty oil tight motor overall. For this engine, the only regular maintenance will be oil changes, valve adjustment, and draining the gas out of the carbs in the winter months. Notably, an oil filter has been added. As the Triumphs have sludge traps, this feature is only worthwhile if the engine is lowish mileage or rebuilt. Otherwise, the horse is out of the barn, so to speak as a filter won’t clean a sludge trap – just keeps it from getting worse. The point being that at 11K miles, you should not have to worry about the sludge trap as the filter has been installed early enough in the bike’s mechanical life. Cosmetic: Overall, this is a great looking bike with a patina finish. It is a rider, not a hider, so some time with polish, etc. will bring up the luster quite a bit. Chrome overall is in very good shape with just some minor pitting here and there. Aluminum parts are the typical dullish patina, but no excessive oxidation. The tank has been repainted per the owner’s statement, but there is evidence of lifting near the neck. If you can resist picking at it, it will likely be fine for quite some time. The bike features faux T120 side covers rather than the stock air boxes. In part, this allowed room for the oil filter assembly. Stock boxes are available, and you can go to a different style oil filter system if you want a more stock look. The PWK carbs have conical air filters but will work with the stock air box too with the rubber adapters. Pricing and Paperwork: As of April 2018, 750 Triumphs are commanding better prices than they have in years. 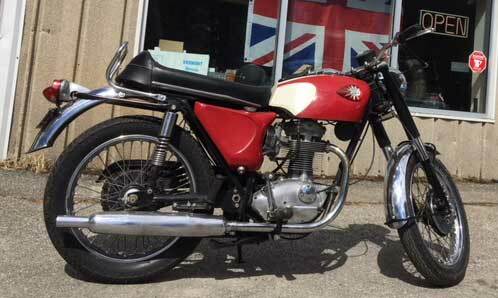 Pristine bikes sell for over $7500 and even a basket case will fetch upwards of $2000. Some of this demand is a function of the season of course. One can expect prices to tail off after Labor Day. Local/regional prices are always higher than remote, eBay sales due to the uncertainty. Since the bike is on consignment at CBE, we feel we remove a lot of that risk. However, please remember we don’t have X-Ray eyes and can only report on what we see. Among the last of the right-hand shift OIF 750’s and first with a front disc brake this bike came to me as rolling restoration project in early 2008. 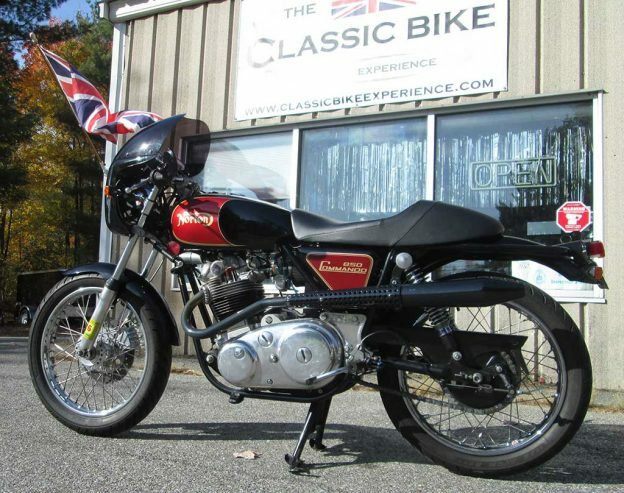 Initial work by Frank’s Brit Bike Barn in NH consisted of a new top end: 0.20 oversized pistons, rebored cylinders, bead blasting and associated guides, seals, valves; brakes with new master cylinder, calipers and new handlebars, some lighting and electrical work. The “house paint” job on the tank was removed and repainted by Brent Budgor (The Vintage Vendor). Over the next year work included: replacement of various cables, indicator lights, new correct OEM tachometer and speedo, Dunstall style mufflers, Pazon electronic ignition and a spin on oil filter. Rebuilt clutch by Classic Bike Experience in 2009. New tires front and rear. The bike has been lightly ridden in the last few years and not at all in 2016-17 as the owner has had some difficulty with carpal tunnel and torn Achilles tendon on kicking side. 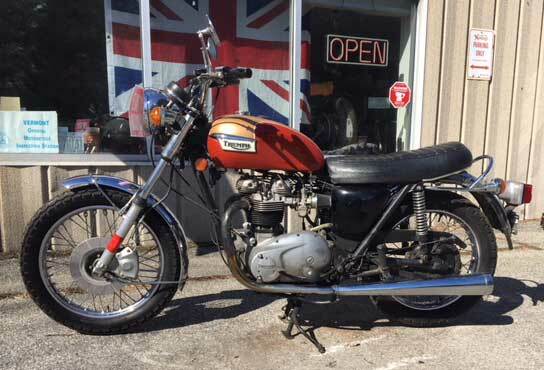 If the asking price is met, I will include OEM owner’s manual, parts manual and 1973 workshop manual as well as a CD of most Triumph parts lists, otherwise available at additional cost. She shared a link to the video below which covers his effort working with Triumph at Bonneville, to break the two-wheeled, land speed record at that time standing at 376.363 mph. 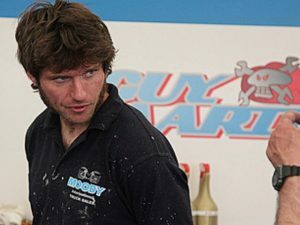 Guy Martin starred in TT3D: Closer to the Edge (click link to watch the award-winning, full-length feature film), a 2011 documentary on the TT’s legendary rivalries and the Isle of Man’s unique road racing history. He started racing in 1998, and made his first appearance at the Isle of Man TT events in 2004, where he gained 15 podium finishes. He has broken his back twice in racing accidents, in the 2010 TT and the 2015 Ulster Grand Prix. By late 2011 he had accrued 21 penalty points on his standard UK driving licence, having been caught speeding several times in his Transit van. He avoided a driving ban when on 18 points, being given another three in lieu of a ban, after the judge showed leniency due to the effect it would have on his livelihood, had he lost it. After a period of “driving like a saint” he was expecting to have regained a clean record by April 2015. Following claims made in his 7 April 2015 Sunday Times review of the Aston Martin Vanquish, in which he recounted testing the car on an early morning lap of the TT course, police opened an investigation. 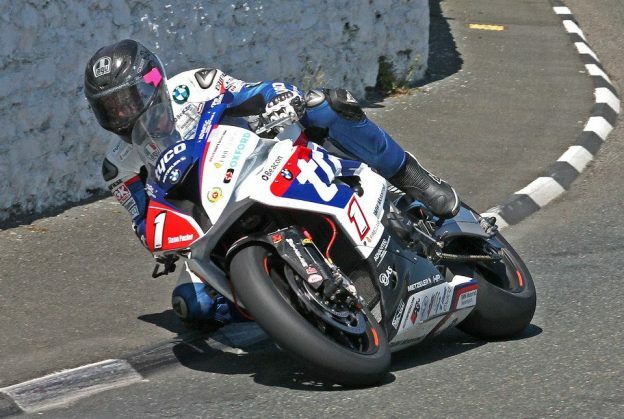 Driving almost the full length of the TT course (joining at Quarterbridge garage and finishing at Governor’s Bridge), he said he was impressed at how fast it really was, reaching 180 mph down Sulby Straight and becoming airborne at Ballacrye corner, resulting in “something like a 22-minute lap”. On 27 May police confirmed that after taking advice from the Attorney General’s Chambers, they would be taking no further action, while reminding residents and visitors that, “Where there is no upper speed limit, road users must at all times be aware that there is a fine line between what is fast and what is dangerous.” A few days later in a radio interview, Martin repeated the claims, and stated he had not broken the law as he had only reached high speeds on derestricted roads (i.e., those with no upper speed limit). If you want to learn more about this Guy… he has written three books about his life, releasing his autobiography, Guy Martin: My Autobiography, in 2014. It reached No.1 in the Sunday Times bestseller list and remained there for at least six weeks, and eventually became the second best selling autobiography of 2014. This was followed by Guy Martin: When You Dead, You Dead, released in 2015, and covering the previous year in diary format, from the 24-hour Solo World Mountain Bike Championship to the Isle of Man TT. It was listed No.1 in Amazon’s sales figures for celebrity autobiographies in November 2015, with his main autobiography being No.10. October 2016 saw the release of his latest book, titled Guy Martin: Worms to Catch featuring his thoughts on the past year and upcoming challenges. This entry was posted in Videos and tagged Guy Martin on December 27, 2017 by Stephen Kastner.